Will SternMate™ fit my boat? SternMate™ will fit on most transoms as long as there is room for the Mounting Plate foot print. HAVE YOU READ YOUR INSTALLATION MANUAL DISCLAIMERS ? I have purchased a new fish locator depth finder with color monitor and transom-mounted transducer. The mounting instructions for the transducer advise that upon putting the boat into the water after installation, I should “immediately” check for leaks and any air bubbles that might be seen coming from the transducer mounting bracket screw holes. We have read that too! (We have also read the installation disclaimers contained within the user and installation manuals written by manufacturers). That is a valid and substantiated request that they make following all transducer screw-secured installations. You appear to be concerned about the potential for leaks and so is the manufacturer of your equipment. Should you choose to mount your equipment directly to the transom as instructed, and at first it appears there are no leaks, you probably won't know for some time whether leaks have occurred or not. By then, water has had time to intrude…how much and how much damage is anyone’s guess. Drilling Screw-holes in Your Boat Hull....Could That Be Good Advice? I have a new boat and will mount my transducer on the transom. I have asked around and some have told me not to worry about drilling holes in my boat as they do it all the time. They tell me that the holes are sealed. Some have told me to screw on a piece of cutting board from "Wally-world" and mount my transducer to that, seal the screw threads and not to worry about it. They can do that to theirs, but that sort of advice sounds malicious to me! Oh, we're familiar with most all of the methods and advice given used to attach a transducer to a boat, thus one of the reasons SternMate was built. They may have taken the advice from others or maybe they failed to think about the consequences. Maybe they had no other options at the time or they were just in a hurry, or did not realize the damages that could be created. Should you feel they have provided sound advice, then it is certainly an option. Most conscientious boat owners; however, would question it just as you have. Having a choice now to mount your transducer correctly makes it mighty nice and can be a far-cry less costly by doing so. There simply is no shortcut unless you're willing to assume the risk. Most likely the manufacturer of your boat recommends that you refrain from drilling holes in your boat hull...particularly below the waterline. He probably makes that point very clear in your boat warranty. Will mounting a transducer directly to my transom cause my boat to leak and possibly sink? Sink? Most likely that won't happen since you've probably sealed your screw holes well. What you must remember; however, is that there is the likelihood at some point that any screw-hole below the waterline or anywhere else for that matter which water can access, could leak. Water will, when given an opportunity and when you least expect it, intrude and most always causes damage. How long it takes before you realize it is unknown. FACT: The "at speed" tugging and snatching by water dynamics against a transducer will loosen and compromise mechanical thread-fastening grip inviting boat leaks regardless of the use of your favorite sealants. My boat is out of warranty and older. Why would I be concerned now about drilling holes below the waterline? We'd think you would want to continue to take proper care of your boat regardless of its age. An older boat is just as susceptible to leaking as a new one. The manufacturer of your boat most likely had the "modification and alteration" language in your original boat warranty. We would recommend to take heed as if it could have been a problem when the boat was new, it could be a problem even though your boat is older now. In short, the manufacturer simply did not care to pay for a claim from leaks or damages from alterations or added equipment after it was built. Its a good policy to follow for the life of the boat. Does drilling holes in a boat below the waterline really make sense? We are often asked how best to repair or fill transducer mounting holes drilled in aluminum boat hulls. Most of the questions come from those who are changing transducers and now have extra holes because their new brackets do not line up with the old. Some just cannot stop the small, irritating leaks from their existing transducer mounts. Fortunately, there are some excellent sealants to plug up those holes, but most object to that sort of unsightly repair. Some have had aluminum plate welded over the holes, painted to match the boat, but that could be quite expensive and you'll end up with an obvious unsightly patch. Sometimes the holes are brazed or filled with weld, ground off smooth, the boat having to be repainted to match. Welding in an aluminum patch could very well cause even more problems. Heat from the weld will most likley be too great and create unsightly warpage in the aluminum skin of of your boat hull. The simplest, quickest and most effective way to remedy leaking or "extra" transducer mount screw-holes in aluminum hulls is with SternMate. The screw-holes should be filled with a product such as Marine Tex, "JB WELD" or PC 7" and flush sanded smooth. SternMate can be installed directly over your repairs and we find that most make no repairs and simply install SternMate™ directly over the screw holes....pretty slick, huh? Is SternMate difficult to install? No, not at all! Installation instructions are illustrated and detailed, but the process is simple. The instructions are furnished in the kit and must be closely followed for a proper installation. Ask your dealer to install it for you if you wish. I installed a transom-mounted transducer last summer on my fiberglass boat. As I began to drill, I knocked a piece of gel-coat off with the drill bit nearly the size of my thumbnail. It looks awful. It makes me ill every time I see my boat. Should I have it repaired and reinstall with a SternMate? I am so disappointed I had not found SternMate sooner. Unfortunately that happens more often than not. Pride in ownership of a nice boat would cause most proud boat owners to have the damage repaired and reinstalled with SternMate. You’ll be much happier. Transducer Adhesives..."let's glue", not screw it ...(up)! I would like to use an adhesive to attach my transducer to my boat hull so that I do not have to drill holes. I am concerned that store-bought adhesive may not be strong enough and might not hold. It's a great idea to attach your transducer without drilling screw-holes; however, it might be very difficult to locate an "off the shelf" adhesive to perform satisfactorily for that application. The design of SternMate™ is closely calculated to assure the perfect "marriage" of extreme demand adhesives-to- materials bonding strength specifically formulated for the installation of SternMate™ to a fiberglass, aluminum, steel or painted wood boat hull following our simple preparation instructions. I have a transom transducer on my boat now. Can I replace it and mount it on SternMate? Yes. SternMate is perfect for a re-fit. As long as your gel-coat is firm and intact and you may choose to fill the old screw holes, or not. SternMate™ will install over the old holes and you’re in great shape for a re-fit. In fact, this question has come up many times as boat-owners are keeping their boats longer and are more conscientious about maintaining them. Note: Do not abrade away the gelcoat surface. Unless you will be mounting your transducer in an entirely different location, install SternMate directly over your repairs in the event you make them. I am getting ready to install a transducer on the transom of my new $30,000 fiberglass bass boat, but it makes me nervous to drill. Do you recommend a sealant? you will have to break the screw seal, reseal the screws, and most likely weaken the integrity of the screw-hole by stripping out the threads in the delicate fiberglass. The dynamics of water tugging against your transducer as your boat moves through the water can be significant. This action can compromise the grip of the mounting screws, the sealant and the integrity of the installation. SternMate is designed to eliminate all of that anxiety. I’d be mighty nervous too! I have a sonar fish locator on my boat which has a transom transducer. The provided transducer bracket has limited adjustment capability and I am unable to get a decent reading much faster than trolling speed. It has become quite frustrating. There could be a number of causes, such as improper wiring, wire guage and run, voltage drop upon acceleration, interfering obstructions, (I.e. lifting or running strakes or thru-hull fittings fore of your transducer). Water is a mess back there and SternMate™ helps you in a very uniuqe way to adjust it correctly. By installing SternMate, your transducer is moved aft and adjusted upward, oftentimes above the running surface of your boat. Contrary to popular transducer mounting instructions, we do it differently because it makes sense and works. Unfortunately, fine-tuning any transducer to operate at its optimum involves trial and error. SternMate is designed to make that task so much more pleasurable. A retro-fit with SternMate could very well be the answer. You may have to fill holes and remount your equipment. Check well for evidence of water leakage from the screw holes in your boat before filling. I recently removed my older transducer and noticed a trickle of water coming from the screw-hole. I did not particularly like what I saw, but installed my new transducer and sealed up all the holes. I'm wondering if there is more water in my boat than I realize. The water in your hull may not be intruding at your transducer screw-holes, but elsewhere. Fiberglass wicks water like a sponge through capillaries and voids in the composite and oftentimes your boat will get heavy. If you notice a performance loss, it may not be your motor, but your boat. Foam soaked flotation can become very heavy and, unfortunately, waterlogged foam will not dry out. We have addressed elsewhere in this section frozen water and the damages it can cause. When water is wicked into the fiberglass and freezes, it will expand causing delamination and more room for more water to enter. The cycle continues absorption, freeze, expansion and can ruin a boat. Aggravating the situation by drilling holes is not recommended. Water contained in a boat hull simply never goes away. SternMate is such a well planned idea for a transducer. I have mounted my outboard on a jackplate so that I can gain maximum performance of my boat. SternMate apparently follows a similar philosophy...a transducer on a jackplate...what a cool idea! Thanks! SternMate was designed around that concept, not only with optimum transducer sounding performance in mind, but having eliminated the necessity of screw-holes below the waterline. We have found that many have not considered the consequences and frustrations associated with mounting transom- type transducers. The jackplate idea has been around for a long time...a boat racer's best kept secret until the early 70's. It is primarly used to gain maximum performance of your outboard boat. We are the first ever to have used the concept for a transducer. So, you are correct. It actually is a mini jackplate for transducers. My boat is a painted aluminum. Will SternMate install on my boat? Yes. Follow the simple instructions as you would for mounting SternMate any other boat; however, the paint must be gently removed to the bare aluminum (see instructions). I am interested in installing new electronics on the transom of my my boat which is currently docked. 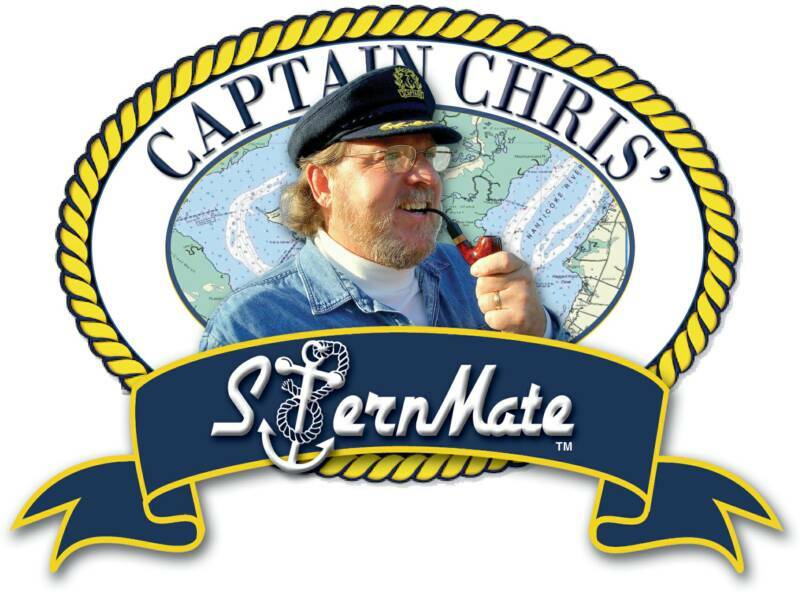 Can SternMate™ be installed underwater without having to haul my boat out? Yes! SternMate™ can be installed under water. SternMate™ adhesive is suited for underwater installation. I have drilled holes in my boat many times and have not experienced leaks. Why should I invest in a SternMate? So have we! We have heard that comment many times. Some folks don't care and for many there have been costly consequences. There is a high probability that the leaks you "have never experienced" have yet to be noticed. Why take a chance like that when now you don’t have to? Think of SternMate as a great way to ensure it " won’t happen to you". Slow water intrusion into a hull can go undetected for a long time and, you know as well as we do, that water can cause all sorts of damage....and never dries up. Consider this: Someday you may decide to sell your boat which has equipment that you have attached, or possibly even your dealer had installed for you, with screws below the waterline....a transducer in this instance. You could very easily eliminate the savvy boat shoppers in the event that he or she were to make a water intrusion examination of your boat simply by removing a couple of the transducer mounting screws....and water dribble out. Just how would you explain that or convince anyone else for that matter, that your LEAKY "TIKI" was "retaining" water through no fault of your own? "Installed my [transducer] tonight. Easy install and so far the unit seems good will find out tomorrow when she hits the water. I did break a dang screw off in my hull. So now I have to repair my boat that has 5 hours on it. Oh well crap happens". Wonder if the repair job will be as nice as the installation? ​This website will teach you everything you might not know about HOW and WHERE to correctly mount your transom-mounted transducers. If water can leak into screw-holes, it is most certain to leak out of screw-holes...particularly during a water intrusion boat warranty inspection. HAVE YOU READ YOUR INSTALLATION MANUAL DISCLAIMERS?